Last updated 26 February 2019 . By Olivia Cheves. Having loomed over Rushey Green since the 1700s, Catford's Black Horse & Harrow is getting a makeover, the likes of which the landmark boozer hasn't seen before. The latest transformation from the Laines Pub team, Ninth Life is bringing festival feels and bucket-loads of character to the humble old pub. Adding to the festival vibe, the food offering is a mixed feast of small plates, burgers and plenty of vegan and veggie grub coming out of the kitchen. Outside in their sprawling courtyard, however, you'll find street food pop-ups serving some of the finest eats in the South East. 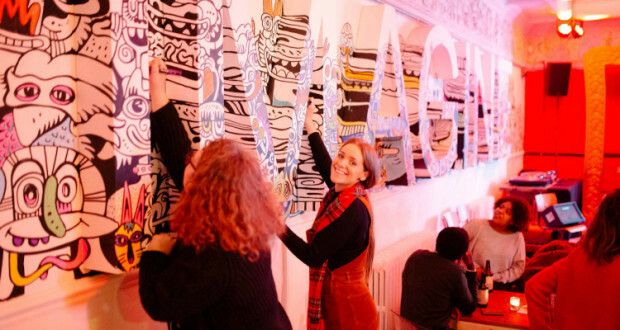 Taking inspiration from public art and wall murals from Bournemouth to San Francisco, the interiors have more than a touch of the fantastical about them, with wall designs ranging from Alice in Wonderland-inspired to quirky doodles. Where the venue really sets itself apart though is with its eclectic events schedule. From jazz jams. craft markets and crowd-sourced exhibitions to a huge immersive adventure that will have you roaming through nine rooms of curious characters and bizarre happenings.